Chevron is a company used to getting its own way, particularly in communities around the world where it operates major refineries. For the last eight years, progressive elected officials in Richmond, CA., and their grassroots organizational allies, have made doing “business as usual” a lot harder for Chevron in the East Bay, a corner of Chevron’s worldwide empire located very near its corporate headquarters in upscale San Ramon. Local critics of Big Oil have sued Chevron over its environmental impact, tried to increase its property taxes, pushed state and federal regulators to monitor the Richmond refinery more closely, marched to that facility’s front gates, with several thousand supporters, joined forces with California and Australian transport workers who are battling the company, and forged a solidarity relationship with Ecuadoran farmers harmed by Chevron’s past misbehavior in their country. “When Chevron officials say, ‘trust us,’ they forget that we once did,” the newspaper editorialized, referring to the unsafe pipe maintenance practices found to be responsible for the huge Richmond refinery fire and explosion two years ago. That was good enough for five council members. To register their continuing objections, the city’s mayor, Gayle McLaughlin, and its vice-mayor, Jovanka Beckles abstained. Both McLaughlin and Beckles are leaders of the RPA, a thorn in the side of Chevron for almost a decade now. The council action—and the permit approval process which preceded it—highlights the importance of having municipal leaders willing to stand up to Chevron, as opposed to simply doing its bidding. Unfortunately, after eight years in office, McLaughlin will be termed out next January. A California Green, she is running for her old seat on the city council and favors fellow RPA member Mike Parker as her mayoral successor. A retired auto worker, longtime labor activist, and now community college teacher, Parker has been a key RPA organizer in recent years and editor of its widely-read newsletter. 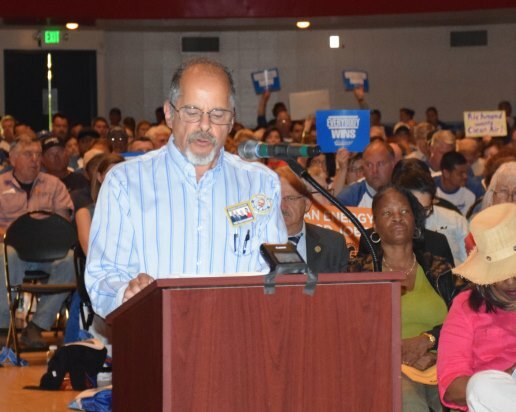 During the protracted local debate about refinery modernization issues, Parker was a frequent speaker at public hearings in Richmond, attended by hundreds of Chevron employees, building trades workers mobilized by their unions, local environmental activists, and concerned citizens. Testifying on behalf of the Richmond Environmental Justice Coalition, at a packed council session on July 22, Parker pointed out that any shift for the better in Chevron’s stance was due to community pressure—and more was still needed. Chevron’s preferred candidate for mayor in this year’s elections is not Parker, of course—but an 82-year old African-American Democrat named Nat Bates, senior member of the city council. Bates believes that, under McLaughlin, “Richmond has earned a reputation of being anti-business with tons of regulations, insensitive elected officials, and staff.” Prior to the council vote, he accused Planning Commission members appointed by the mayor and McLaughlin herself of being “irresponsible” and making “ridiculous extortionate demands” during the permit approval process. “They treated Chevron like a sugar daddy ATM machine with unlimited withdrawals,” he grumbled. To follow the upcoming campaign action in Richmond, where political “nuts” make more sense and get more done than most of the city’s “mainstream” politicians, BeyondChron readers should check out: http://richmondprogressivealliance.net/ which has links to the campaign websites of “Team Richmond”—Parker, McLaughlin, Beckles, and Martinez.